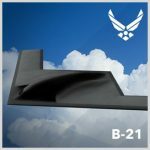 Randall Walden, director and program executive officer of the U.S. Air Force’s rapid capabilities office, has said the value of the engineering, manufacturing and development contract for the B-21 Long-Range Strike Bomber aircraft should remain classified, Breaking Defense reported Tuesday. “Releasing that, releasing other things that may be more insightful to our adversaries, I don’t think helps the taxpayer… the warfighter, because all we’re doing is, we’re putting them at risk,” he added. Vivienne Machi also reports for National Defense that Walden told event attendees in Virginia that the EMD phase of the B-21 bomber program will cost approximately $23.5 billion based on an independent cost estimate. He also said that the service branch expects to achieve initial operational capability for the B-21 aircraft by 2030 and continue fleet deployment operations through 2060. Gen. David Goldfein, Air Force vice chief of staff, said during a Senate panel hearing to discuss his nomination for the chief of staff post that he agreed with Senate Armed Services Committee Chairman John McCain (R-Arizona) that the service branch should reveal the value of the B-21 development contract. Northrop Grumman received a contract in October to develop the B-21 plane.